Do you rack your brain every year trying to think of what to give your other half for her birthday? Or do you find yourself full of gift ideas but you end up deciding that none of them are good enough? I bet she’ll appreciate a beautiful ring for her birthday… much more than a new mobile phone. Keep in mind that technology may be handy but a gemstone is a great investment and an excellent gift idea! Ring with 7-carat Andean Opal, birthday gift for Anna. Anna’s husband wanted to surprise her for her 30th birthday with a very unique ring made especially for her. He brought me a coloured stone a cousin had given her, which had been lost at the bottom of a drawer for ages. It was a 7 carat, emerald cut Andean Opal. Opal is a very delicate stone that’s easy to get scratched, so it needs to be set in a bezel that offers stability and protection. Andean Opal has the same type of ore found in Australian Opal, but the colour is very different; it’s translucent with a colour ranging from yellow to brown and has no internal reflections. 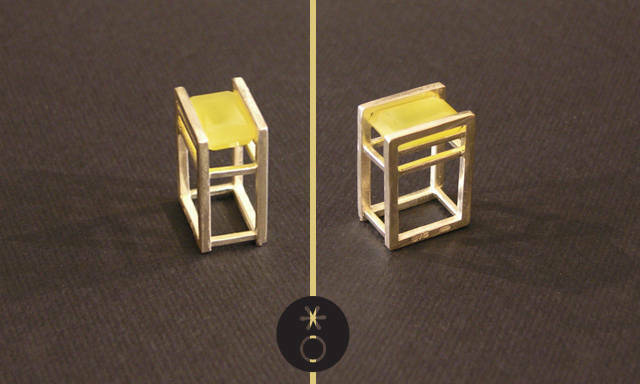 What we designed for Anna, who’s an architect, is a rectangular silver ring – almost an architectural wire frame with a sandstone finish to support the opal. What’s unique about this artisan ring is the absence of a chiselled bezel. I created the site for the stone in silver with a chisel, and after enclosing the stone inside the ring I welded it cold. These terms are a bit technical; generally to cast the metal part enclosing the stone it would need to be riveted without welding. In this case I’ve come up with my own, innovative solution. What original gift could you give your other half for her birthday? Let’s find a lovely solution together. Contact me.